Rahul Gandhi may be remembered by posterity as the Antoni Gaudí of Indian politics. Antoni, who died in 1926, was a marvellous architect who made Spain proud. But he is also known for the "world's most notorious unfinished project". Work on the Sagrada Familia Church in Barcelona, which began in 1882, was abandoned and resumed so many times that it is expected to be completed only in 2026, the centenary of Antoni's death. Some say even that is doubtful. It's not surprising that it has been called a work "permanently" in progress. Rahul's predilection for starting and abandoning political projects is an unmistakable hallmark of his career. Take, for instance, the way he surrounded himself with the awesome troika of Hardik Patel, Jignesh Mevani and Alpesh Thakor during the December 2017 Gujarat Assembly election, giving the BJP a fright. It was hailed as Rahul's political 'arangetram'. But the Congress chief abandoned this "social engineering", and Thakor has now abandoned Congress. Between these two alleged accomplishments came another in Karnataka. 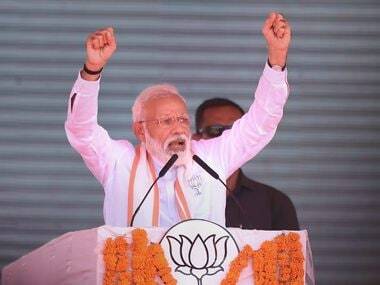 In May 2018, he brought the Congress and Janata Dal (Secular) together, in what might be an alliance that was rustled up in the shortest time in India's history. Rahul's admirers claimed that the sagacity he exhibited surpassed the combined wisdom of Chanakya and Confucius. Then after the alliance formed the government in Karnataka, he abandoned it to live its own life or die its own death — he didn't seem to care which. Having achieved its primary purpose of keeping the BJP out of power, the alliance has since remained, like Antoni's church, a work "permanently" in progress. Some might argue that as the president of the Congress, Rahul himself is a work in progress. The coalition has been bumbling along like a blind man who lost his cane. 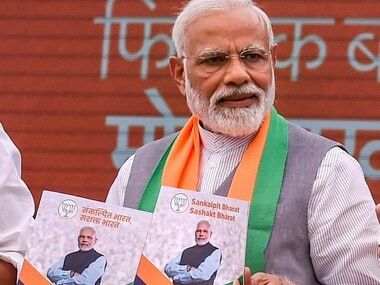 Since it was cobbled up, almost not a day has passed without leaders of the JD(S) and Congress taking potshots at each other, starting with squabbling over distribution of posts to allocation of tickets for the Lok Sabha election to be held in the state on 18 and 23 April (phases 2 and 3). Even with four days to go for the first day of polling in 14 of Karnataka's 28 Lok Sabha seats, senior leaders of both parties are spending more time preaching unity to workers than undertaking joint campaigns against the BJP. 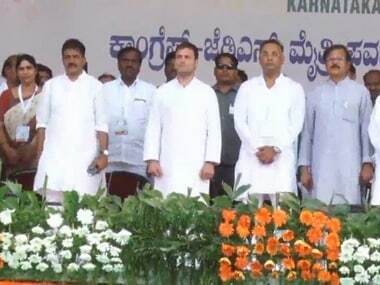 It was in this context that Rahul picked Krishnarajanagara in Karnataka to address an election rally on Saturday, apparently on the advice of Chief Minister HD Kumaraswamy to bring peace to the warring parties. Krishnarajanagara is in Mysuru district but is part of the Mandya constituency, where the chief minister's son and 29-year-old budding actor Nikhil Kumaraswamy is a candidate of the Congress-JD(S) alliance. 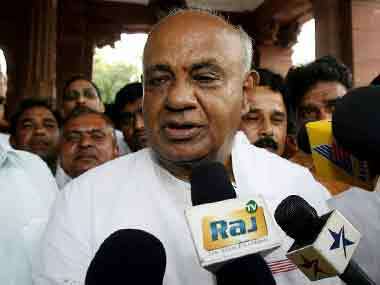 Mandya also happens to be among the seats where the shadow-boxing between the two parties is most appalling. Pitted against Nikhil is Sumalatha, an actress and the wife of popular Kannada film star Ambareesh who died five months ago. Ambareesh had won the seat twice earlier on a Congress ticket and was a minister in the UPA government. After the Congress denied her a ticket, Sumalatha decided to contest as an Independent, and that's when things went further downhill. Sumalatha is getting support from not only the BJP, which has not a fielded a candidate of its own there, but also from sections of the Congress who are refusing to back Nikhil. The resistance in one party of the alliance to work for the candidate of the other is quite brazen in southern Karnataka, where both have strong bases and have been dog-eat-dog sort of rivals for long. 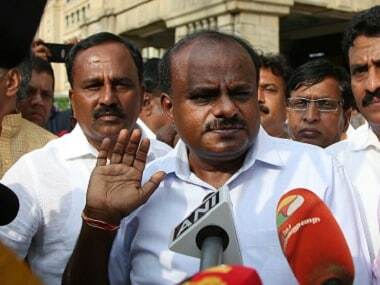 This has been rightly seen as no more than vicious animosity between Kumaraswamy and his father HD Deve Gowda of the JD(S) on one side and senior Congress leader and former chief minister Siddaramaiah on the other, with both sides fighting for political supremacy in the region. This naturally translates into a tussle between Deve Gowda's upper-caste Vokkaligas and Siddaramaiah's backward caste of Kurubas.